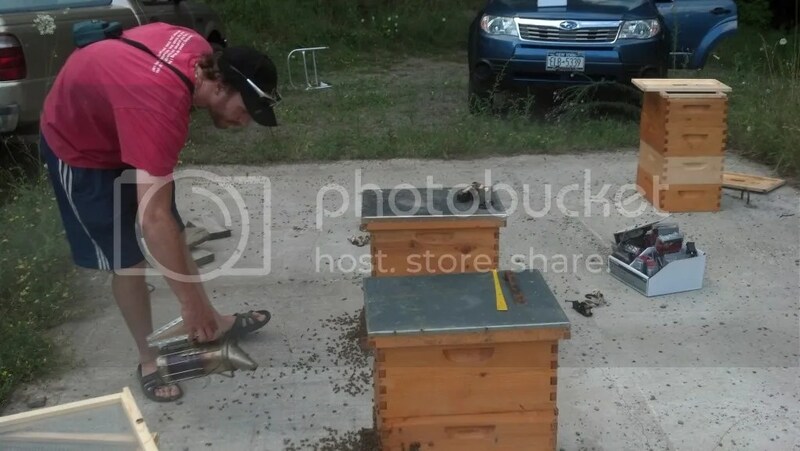 I moved my Wixom Farm apiary to a new location, about 10 miles closer to my home. 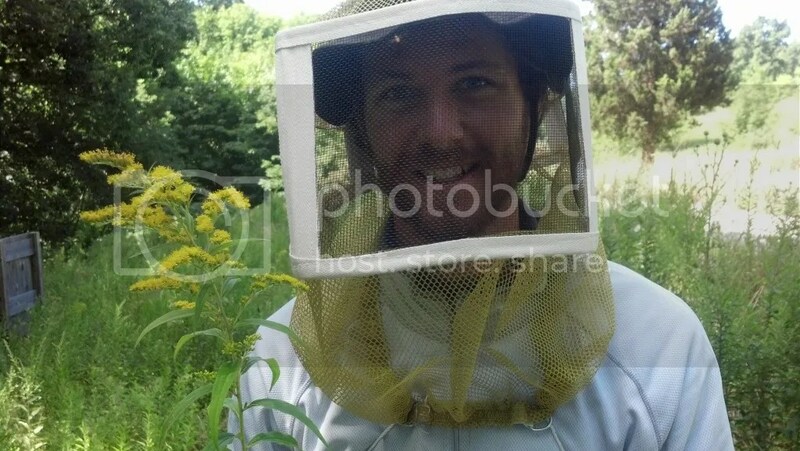 Moving 10 mid-summer hives is not a trivial matter, but was made much easier by my friend and fellow beekeeper, Max. 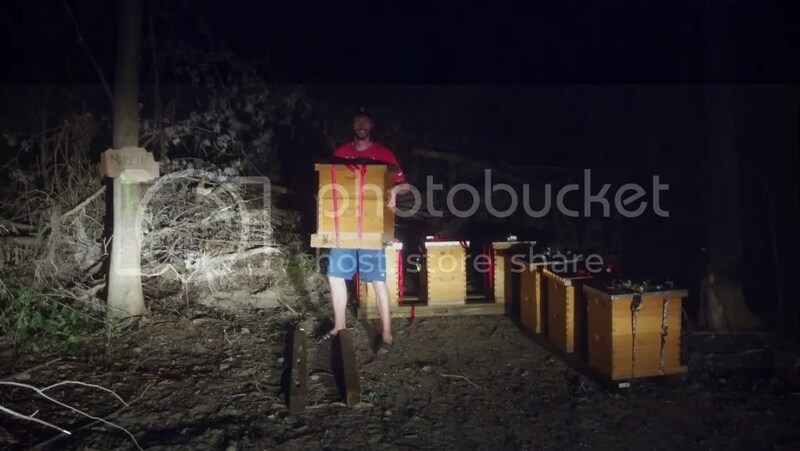 The plan was this: arrive at the apiary about 7 pm, remove the supers, screen off the entrances, ratchet strap the hives together, load on the truck, and move to the new site. Removing the supers meant removing the bees from the supers, and then coaxing the bees back into the hives. As you can see, Max was wearing shorts and sandals for this adventure. I was in long pants and sandals. We didn’t even use veils for this part, since it was pretty hot outside, and the bees were (mostly) in a good mood. 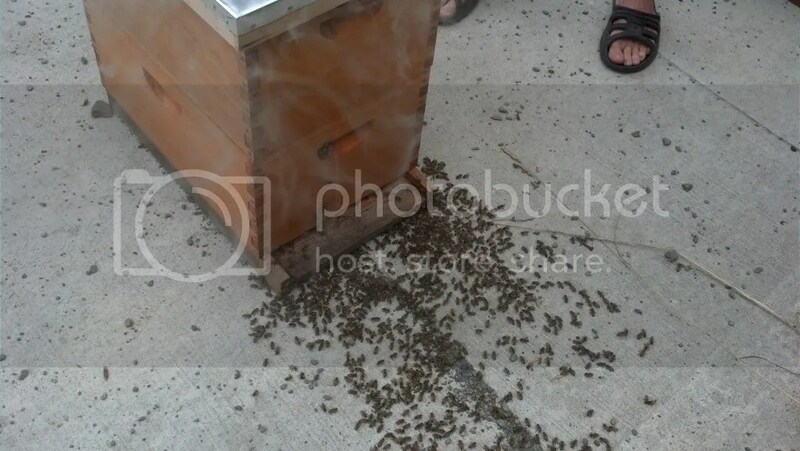 One hive was a bit fractious towards the end, but that sort of thing happens. We coaxed them back in with smoke, but even though it was evening, foragers were still coming and going, and getting the entrances screened off was a bit difficult. I didn’t want to leave more bees behind than necessary. 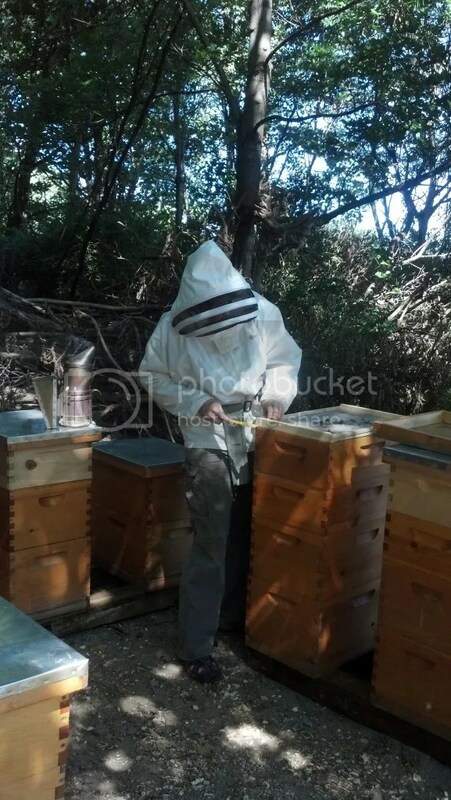 Eventually, though, all the supers were removed (you can see them in the background in the picture above, stacked on the right), and we put two ratchet straps on each hive. By the time we started loading the pickup, the sun had set, and we were working by the light of my car’s headlights. 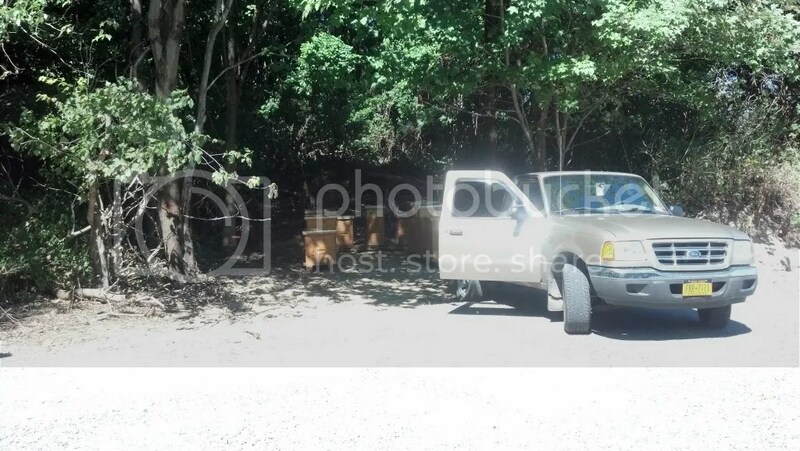 Seven hives fit on the truck. 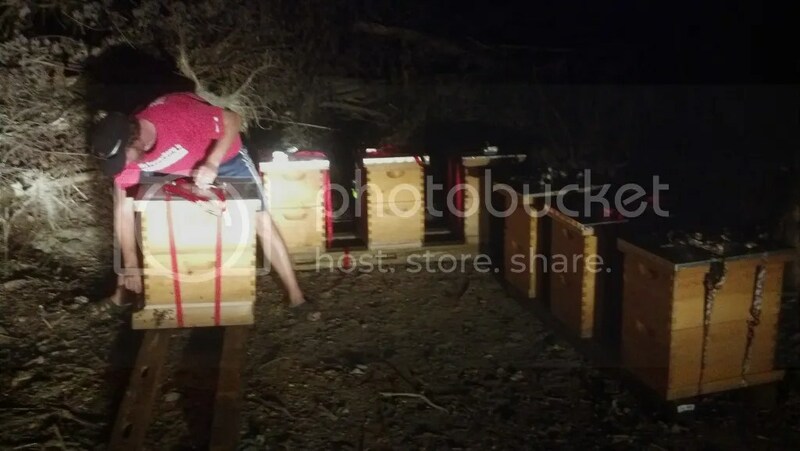 We drove it to the new location, put down the wooden “stands” (aka fence posts), and placed the hives in their new location. The fractious hive remained fractious, and Max and I took a few stings as bees buzzed out and let us know they did not appreciate all this disturbance. 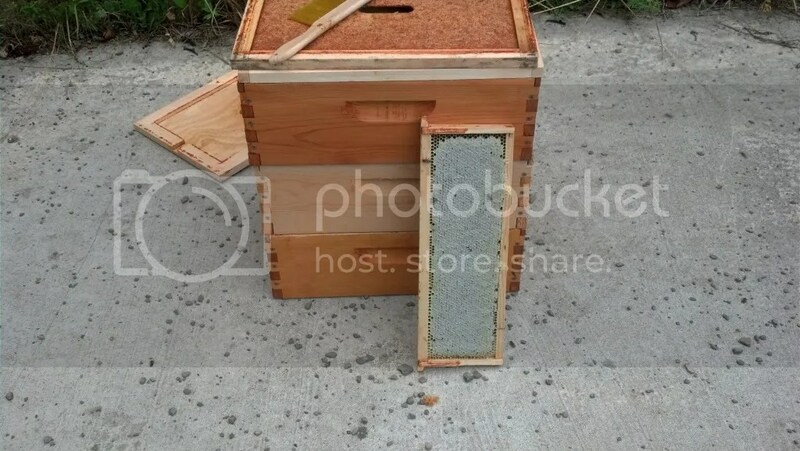 But even so, we used the two person hive carrier for a few of the hives. At this time of year, two deeps can weight over 150 lbs. One strong person could carry a heavy hive, of course, but I wouldn’t want to be around if it got dropped! The next morning, we returned and picked up the last three hives and the supers, and in the light of day, made sure nothing was left behind. I put the supers back and checked on the girls’ mood. Everyone seemed fine, with no robbing or other apparent distress over the move. The hives in the new apiary are closer together than I’d like, and no doubt there will be some drifting between colonies, but on the whole, I like the location. 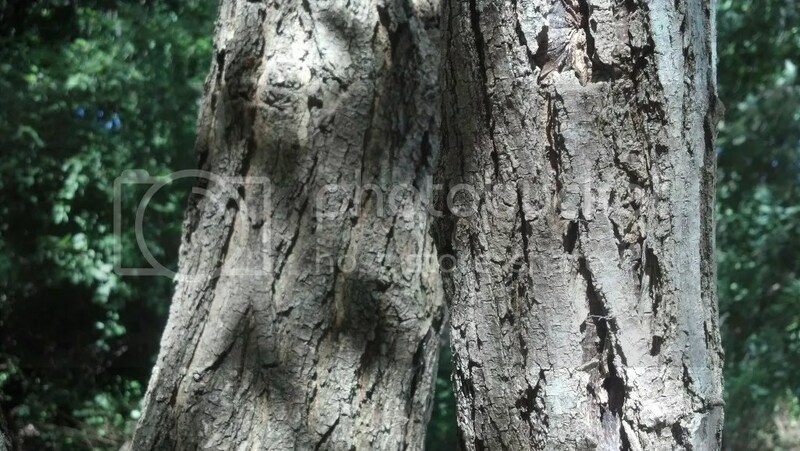 The bees are under a stand of black locust which makes a nice honey. There are plenty of maples around for spring build up, some purple loosestrife (a terrible invasive, but a good honey plant) not far away, goldenrod in the fall, and so on. I think it will work out. And there are two more positives: I can drive right up to the hives and there are two porta-a-potties on site. Never underestimate the importance of those two beeyard amenities! Once that adventure was over, I had to prepare for a class at GreenStar Coop in Ithaca. I was asked to teach a class on backyard beekeeping. I love talking about bees, and I love teaching people about bees, so how could I say no? The class began at 7 and went until 8:15–it was just enough time to hit a bit of biology, a bit of budgeting, a bit of bee health, a bit of time management, and a whole lot of bee stories. I hope that everyone came away from the class fired up to learn more about backyard beekeeping, ready to join the FLBC, and maybe even start a hive or two next spring.